REFINE Details- Permanent results, at home. Freedom from endless shaving & waxing. Get better results in half the time with the Tria Hair Removal Laser 4X, the only FDA-cleared laser available for home use. The upgraded digital display featuring Tria's exclusive pulse counter lets you treat your face and body more confidently. Only Tria Laser 4X uses the same diode laser technology preferred by dermatologists to deliver permanent results at home. Study published in Lasers in Surgery and Medicine. Easy to use and with 5 comfort settings, Tria's laser for hair removal is guaranteed to deliver permanent results. Unlike other at-home hair removal methods, the Tria Hair Removal Laser uses the same laser technology used by professionals for in-office laser hair removal for permanent results in the comfort and privacy of the home, at a fraction of the cost. Key Benefits: Dermatologist recommended for permanent results. Clinically proven to eliminate the need for regular shaving and waxing. Redesigned/upgraded digital display: The digital user-interface window easily guides you through treatments and helps troubleshoot errors. View 5-comfort settings, battery charge, a skin sensor indicator and the lock status of your device. The upgraded display of the Tria Laser 4X also features Tria's exclusive pulse counter, allowing you to track the number of pulses administered within any single treatment area to target the optimum number of pulses and ensure complete coverage accuracy. Built-in skin sensor: Tria Laser 4X has a built-in skin sensor safety feature to automatically sense and check your skin tone. If the Tria Laser 4X is suitable for you to use, it will emit a series of beeps and unlock. Ergonomic design: A sleek, hand-held design and slim handle make treatments easy. And the angled tip gives you enhanced visibility to deliver laser light with expert precision to the treatment area. 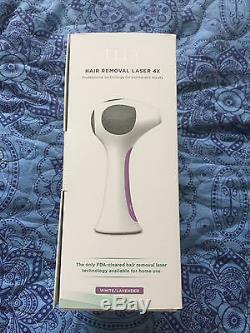 FDA-cleared: Tria Hair Removal Laser 4X is FDA-cleared. This means that the United States Food and Drug Administration (FDA) has cleared the Tria Laser 4X to be marketed as safe and effective. This stringent clearance was received after the FDA determined that Tria has conducted sufficient valid scientific evidence and that the Tria Laser 4X is substantially the same as professional laser hair removal devices. Clinically proven safe + effective: Tria Hair Removal Laser 4X is clinically proven to be a safe and effective at-home laser hair removal device. There's no need for goggles or concern. Tria's patented technology means that Tria Laser 4X will not damage your eyes or skin when used as directed. Treatment times + results: Treatment times vary based on the size of the treatment area. Smaller areas like your underarms take a few minutes and larger areas, like the upper leg, can take 25-30 minutes. Start seeing results with just 2 treatments, and imagine permanent freedom from endless shaving and waxing in as few as 3 months when used weekly. Wheeland, MD, FACP, Lasers in Surgery and Medicine, 2007. When treating weekly for three months, you should expect the following results: After your first month: Clinical studies have shown up to 70% reduction after just two treatments. On occasion, some users experience mild redness that quickly dissipates within 24 hours after your first treatment. After 2-3 months of treatment: Hair re-growth will begin to appear lighter and finer. You will begin to see a visible reduction in the amount of re-growth, especially in areas where hair growth tends to be dense. After 3 months of treatment: Hair follicles that have been deactivated by the Tria Hair Removal Laser 4X will no longer grow hair. Continue to use the Tria Laser 4X as necessary for touch ups until your skin is smooth and you're free of the endless hassles of shaving and waxing. 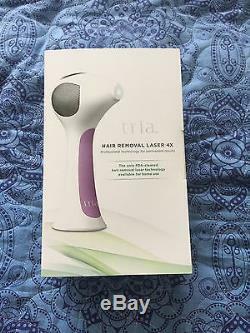 The item "Tria Beauty Hair Removal Laser 4X" is in sale since Monday, May 22, 2017. This item is in the category "Health & Beauty\Shaving & Hair Removal\Laser Hair Removal & IPL". The seller is "clean1line" and is located in Weslaco, Texas. This item can be shipped to United States.